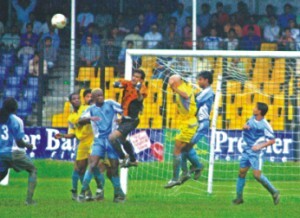 Abahani's title hopes in the Premier Foot-ball League suffered a massive blow when they were held to a goalless draw by Farashganj Sporting Club in a match that saw both sides ending with ten men. Bangladesh's tour of India next October looks unlikely as it will clash with the International Cricket Council's (ICC) new fixture, the Super Series. Australian cricket star Shane Warne on Monday spoke of the pain at the end of his 10-year marriage, but assured fans he would not allow his personal life to impact on his performance during the Ashes. Australia captain Ricky Ponting scored 111 as the world champions levelled their one-day series against England at 1-1 with a seven-wicket win at Lord's here Sunday. Aslam just a ball boy! BKSP moved into the semifinals in the BKSP Under-16 Football Tournament with a comfortable 4-0 victory over Khulna in a Group A fixture at the sports institute football ground yesterday. Bangladesh finished fourth in the First Asian Women's Kabaddi Championship when they lost their play-off game against Sri Lanka 60-20 in Hyderabad, India yesterday. The Bangladesh Cricket Board (BCB) handed over a cheque to Mrs Anowara, the mother of late sports journalist Monwar Ahmed, at its Gulshan office yesterday. Sri Lanka begin an emotional Test series from Wednesday, the first at home since the tsunamis ravaged the island nation seven months ago, hoping their depleted West Indian rivals will join the party. Brett Lee did his chances of a Test recall no harm at all by taking five wickets as Australia strolled to a seven-wicket one-day international win against England at Lord's here Sunday. Liverpool manager Rafael Benitez has described Fernando Morientes as 'like a new signing' and revealed he has high hopes for him this coming season.